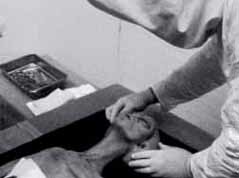 NetControl.net Archive of :: "Alien Autopsy"
Seen the new hoax photos floating around the 'Net? Before you ask - we did not have anything to do with creating them, and we don't know who did. Anyway, whoever did this has done a great job, and we'll be adding a more detailed commentary about the pictures as soon as we have the time. 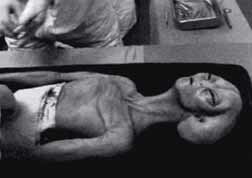 "Alien Autopsy" - Faked Or Fiction? Rent the video, read along as you watch, and play Spot The Goof ! Our ongoing tally of other FX artists' opinions. A few selected comparisons with authentic human autopsies. Warning! Not for the squeamish! Well, not really. Actually, a list of Makeup FX reference books and mailorder supply sources. Hey, what about that "authentic" 1947 footage? Except where noted, the text contained in these pages is © The Truly Dangerous Company. However, the text may be redistributed for informational purposes after obtaining permission.. Please direct inquiries to [email protected]. Thanks. The behind-the-scenes FX photos included in this site were donated by, and remain the exclusive property of, The Character Shop and are not to be reproduced in any way without their express permission. ... reprinted in slightly modified form in the January/February '96 issue of The Skeptical Inquirer. ... the recipient of an impressive amount of nutty email.